White lines were visible where the map had ripped, the brighter inner fabrics of the paper standing out from the stained surface. 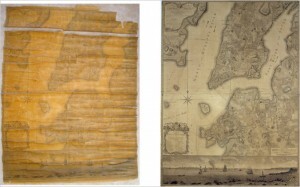 Mr. Derow visited Argosy Book Store on the Upper East Side and bought a handful of obscure old books — among them, for example, “The Select Dialogues of Lucian, to Which Is Added, a New Literal Translation in Latin, With Notes in English,” from 1804 — that were printed on cloth paper, like the map, and not wood pulp. He performed on them a technique that should chill the blood of any author, wondering where his books will be in 200 years: he baked them in his kitchen stove and boiled them in water. He painted the resulting brackish stew onto the white lines, matching them to the rest of the map. Yay, for the map! Sad, for the Lucian translation. Ah well, one classic helping out another! Thanks for noting that, Yurie. It bothered me, too. I wonder whose 1804 copy of Lucian it was and what its provenance might have told us about the study of classical antiquity in early 19th c. America. It also made me wonder what other books were sacrificed to the cause. I’m not saying it wasn’t worthy–the map certainly was a rarity that should be saved. It’s just too bad it had to be a zero-sum game.